Update to version 0.15.9.1 "Liepmann", now with voxel-model based aerodynamics! Users who put issues on Github are awesome. Please consider being awesome. Shape-Based, Vessel-Centered, Aerodynamics - Long, thin shapes drag less than wide, flat shapes, and smooth changes in body width reduce drag. The shape of the vessel as a whole, not individual parts, controls drag, so shape the vessel as you see fit. Emergent Fairings and Cargo Bays - The voxel model method FAR uses allows for the actual shape of the vehicle to play a role in how lift and drag are applied. Build a hollow shell, and close it up, and everything inside it will be protected from the airflow as it should. Wing Effects - Realistically adjusts lift based on wing position and configuration: wingtips lift less and drag more than wing roots. Stall - Passing the critical angle of attack suddenly reduces lift and greatly increases drag. Can put planes into tailspins, flat spins, and cause crashes. Mach Effects and Area Ruling - Lift and drag will vary as expected with Mach number. Supersonic planes will need to properly area rule themselves for optimum flight characteristics. Body lift - All parts lift: a fast enough brick will fly, if not that well. Get v0.15.9.1 "Liepmann" from SpaceDock! Get v0.15.9.1 "Liepmann" from Github! Post your crafts there, not here, please. Violators will have their posts moved by moderators, and will have everyone very annoyed with the additional workload for both moderators and me. Part.cfg changes powered by sarbian & ialdabaoth's ModuleManager plugin. Toolbar powered by blizzy78's Toolbar plugin. Copy the GameData and Ships folders into the KSP root directory and merge them with the existing GameData and Ships folders. Make sure that you copy over everything in the GameData folder. Serious issues will occur unless this is done. Option for aerodynamic failures to result in explosions at the joint during failure. 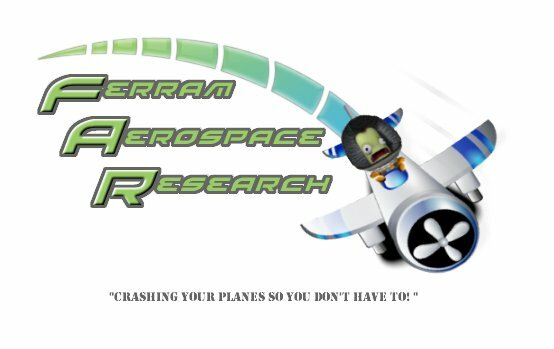 What does this mod do that stock KSP doesn't? Stock KSP calculates drag as a linear combination of the drag properties of a vehicle's parts, with some interaction changes to handle some of the most obvious aerodynamic interaction effects. FAR instead calculates the drag from the vessel shape as a whole, resulting in a more realistic model of aerodynamic drag and body lift. In addition, FAR accounts for wing shape, rather than just overall area like stock KSP. Finally, thanks to the overall vessel model, FAR can account for things like area ruling, where the vehicle's area cross-section must vary properly in order to fly at supersonic speeds (well, without MOAR BOOSTERS, in any case). I don't like my rocket coming apart under heavy aerodynamic loads; how can I turn it off? In the Space Center scene FAR has a debug menu that can be accessed to mess with a large number of the parameters. Under the "cheats" section of the first tab there is an option to disable aerodynamic failure. Does this plugin work properly with other mods / part packs? Sure; FAR figures out what the properties of the part should be based on its dimensions and some basic aerodynamic assumptions. If you use a mod and suspect that it causes unrealistic behavior, search the thread to see if it has been brought up / addressed by the latest release; if it hasn't, feel free to bring it to my attention. The only exception is with wing parts, which are more complicated and currently must have their properties specified manually. Does this plugin make payload fairings and cargo bays work properly? Yes, it will support any and all fairings and cargo bays. Even those that you make out of completely unrelated parts, so long as you close up the shape. In fact, to FAR, there is little difference between the inside of a closed fairing and the inside of a fuel tank part; they're both just as internal to it. I can't seem to turn off the Flight Assistance Systems... what's going on? In the Flight Assistance GUI every button that is pressed activates a control system; when none are pushed down no control systems are active. I suspect that you've actually created a poorly designed craft and that you're attributing aerodynamic forces that you're not used to dealing with to non-existent control inputs. Do I need ModuleManager and/or ModularFlightIntegrator? Yes; they are used to properly apply aerodynamic properties to stock wing parts and to interface properly with the game's physics system. Not using them will cause FAR to not function. I'm using the win64 KSP build and I am still too outraged to read the topic title or changelog, please mock me. Very well, I shall. Haha, silly person. Anyway, win64 is now unlocked for the foreseeable future. If it turns back into the crashtastic support-heavy nightmare it was, the lock may return, but I do not anticipate the need to do that. Awesome! Looks like a great plugin. Keep up the good work. Amazing, C7 needs to see this. Might be a very nice addition to the gamer. Can somebody please send me a link to a modified version of this that removes the ability to specify an axis on a control surface? It is very frustrating to have to change the settings every flight. Random, I'm currently working on something to fix that, in the mean time, you can switch the axis before physics starts, since you're just waiting there for a few seconds anyway. I agree, it's annoying, but it's currently a means to an end. Quick question, do I use less fuel the higher I am (not sure if its in the game). Oh and I agree its a little annoying having to change the axis every time but it's amazing that I can actually do it so I'm not too bothered. Depends on the aircraft. Normal jet engines get more efficient with altitude. Piston engines stay about the same. However, Ramjets and Scramjets get more efficient with speed and remain about the same with altitude, however the limiting factor with them is heat. The lower altitudes cause these types of engines to get hot much faster due to air friction thus they are only really good once you get into the upper atmosphere where you can go faster with less air friction. Thanks man one more question, how do I distinguish a basic jet engine from a scram/ramjet? I have wanted this since the first day I played KSP. Thank you. Version 0.2 released! Lots of new goodies for all of you, and 0.17 compatibility! Okay, I have feedback. Some positive, some negative. The positive: I can finally stall an airplane in KSP! Great! Your GUI is clear, easy to understand, easy to work with. I'm so glad somebody's finally tackling this project. I built a very simple plane and flew it around with my keyboard, and it handled very easily. Definitely more newbie-friendly than the stock game. The negative: Your "plugin" folder should be "plugins", or the mod won't install. Control assignments for the standard canard and standard control surface are mixed up somehow; both of them have their pitch and roll assignments swapped. I tried setting the small control surface to yaw, and it doesn't move at all. My biggest problem though... can I have an option to completely turn off flight assistance? Some of us don't need the training wheels, ya know? I strongly dislike how the plane handles with this extreme control damping. I tried setting all k values to zero, and didn't perceive any difference. Sorry about the gripes. This mod has such fantastic potential. Okay, I just tried messing with the standard canard, standard control surface and small control surface on a standard install and they worked fine. Were you using a joystick when that happened? Can you post a craft file that had this problem, since I don't think it's with my code (at least I can't replicate it from the description). Also, if you don't have any of the autopilots selected (so that they show the k values) then they're off. It is possible you're talking about the 1/4 second it takes the control surfaces to fully deflect, which I'm starting to think is a little to much. (Maybe 1/10 of a second? 1/15? *shrug*) It's supposed to be a smoother change in angle of attack for the control surface, more like a real plane, but I might have overdone it. And finally, what other plugins do you have installed? And I'll fix that error about "plugin" instead of "Plugins." Um, the flight assistant spazzed out when the game went from the frozen 'loading' state in the flight scene to physics-enabled on the runway. I had to alt+F4 to get off the flight screen. What other plugins were you using? The only time I've seen anything like that happen is when I'd get a part to throw a ton of NullReferenceExceptions (which was never the flight assistant stuff). When the flight assistant "spazzed" what did it do exactly? The only reason I ask is because if I can't recreate the bug on my end, I can't track down the problem and fix it. Ah, I might be able to reproduce it and post the output log tomorrow morning (GMT). Sorry for the bad initial report, but I was working with the forum when it was a bit laggier. The first time it happened, the other thing on the HUD was the Romfarer Lazor System startup (0.17 version). In that instance the assistant almost appeared to 'jerk' off to one corner of the screen in a few milliseconds. When I uninstalled RFLS, the assistant seemed to be showing up fine until the end of the loading sequence, when the aircraft was released into physics, which was when the box turned mostly grey with a tiny corner which seemed to be showing all the content of the box. As I said, I'll work on the stuff you need in the morning. It's 11PM here otherwise I'd still be troubleshooting all my plugins! Edit2: Right, weirdness happening now. I can only reproduce the bug when RF Lazor System's GUI is also drawn on flight start. I couldn't find any mention of your plugin in the debug, but you can have my ridiculously spammed output file anyway. I have a new problem again: My FPS drops below 10 and stays there when this plugin is installed, or at least that's how it seems. I'll try my KSP_win without FAR installed and see if that changes anything. Scratch that. The game just didn't want to run at the same time as Flash Plugin for Firefox. The solution? No music for me while I fly! Might I suggest a theory? There might be a GUI incompatibility between this plugin and Romfarer Lazor System. I'd love to see them working together rather than having to choose. Well, I was able to confirm the Lazor-FAR problem Volt, and you're right: it is a GUI incompatibility. It's actually similar to a problem I ran into first adding the flight assistant window. I'll see what I can do with this but I don't think it'll be too difficult. As for the in-editor problem, I'll see about that, but I'm giving the GUI there a minor overhaul to make it more useful. Odds are I just forgot to make the entire window drag-able and the section that can be dragged is just a little too small. I should be able to have a new version up soon that fixes these. Awesome. I enjoyed feeling like things were a little more realistic when I did manage to get FAR working, but I'm having trouble building stable planes because the type of wings that produce optimal lift are wobbly as hell in KSP and the changes to control surfaces make it even wobblier during maneuvers. Okay, v0.3 is up. Bunch of bug fixes, some GUI work done. It should also play nice with Lazor System and MechJeb. Sorry Hyratel, saving placement will have to wait until the next version, but the GUI can be minimized. As always, bug reports are welcome, please give as much info as possible so I can find the problem. Edit: Didn't update download link. Is fixed now. Very nice plugin, makes it feel a lot more realistic. Keep up the amazing work. Yep, the variable sweep parts from DA should work properly here. Granted, some testing will have to be done, since the stability of the plane will change a whole lot when you do that. So, as an update on progress, I've figured out a way to override the original drag model on fuel tanks and engines and so next update all remnants of the old drag model should be gone. (HOORAY!!!) It'll be up today or tomorrow, since I'm trying to balance the engines and drag to something reasonable. So far, I've got the TurboJet engine making ~50 kN thrust (as opposed to the 150 kN default) and two of them can sustain a plane at Mach 2.8. I need to work on the airflow values so it isn't overpowered at ground level. I also want to tune the Basic Jet Engine so it can break the sound barrier, but only if you design and fly your plane just right. I'm not even touching the rocket parts yet, since balancing that is another can of worms entirely. Next update is gonna be totally awesome!